Postal Tube Staplers - Secure the plastic end caps of your postal tubes / poster tubes or other items with a stapler, tacker or heavy duty staple pliers from our range below. Many customers, as an extra security measure, may prefer to staple their postal tube caps in place. The DEF-SKU: HSP 12 Heavy-Duty Staple Plier is the perfect tool to do so. 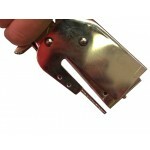 These Staplers can be bought on their own or as a kit with staples.